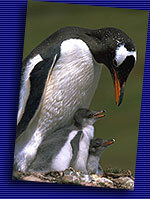 We can provide you with high-quality color prints of any images on this site, or from the pages of Penguin Planet. All prints are sharp, digital prints, made from the original image. All are sent unmounted, with the artist's signature on the back. For other sizes, please contact us for a quote. All of the above come unmatted and unframed. Prices do not include shipping or tax (WA state only). Any of the images on this site - and hundreds more in the Penguin Planet Collection - are available for commercial uses, including advertising, promotional use, product labelling. Check our stock photography page - or contact us for more information. NOTE: Please be aware that it is impossible to exactly match the color in a photographic print that you may have seen printed in a calendar or magazine. The processes that create the two are very different, and the results often vary. Please be assured that we will make the very best print possible, but it may not look exactly like its offset-printed counterpart.